New Book from the Elevate Teachers Founder! 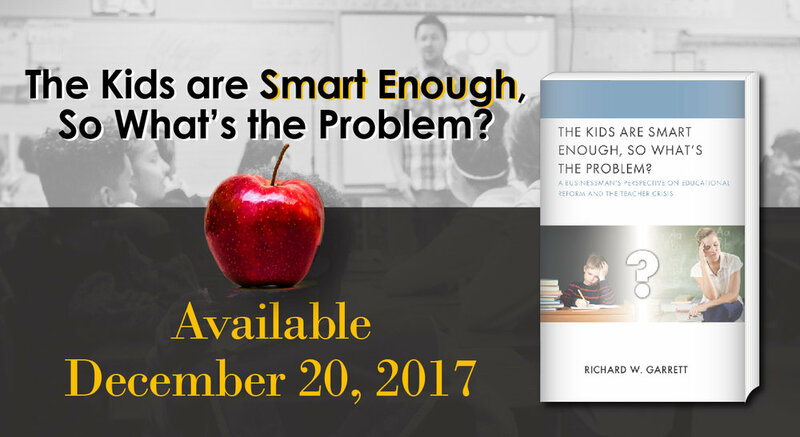 ElevateTeachers.org founder, Richard W. Garrett, has a new book launching December 20th titled The Kids are Smart Enough -- So What’s the Problem? A Businessman’s Perspective on Educational Reform and the Teacher Crisis. The book focuses on the negative impact that a small number of students, in each class, have upon the learning process. These disruptive students result in a significant amount of lost time in each class; these disruptions further and dramatically increase teacher frustration causing many to leave the profession. By scouring data, gaining insight from veteran educators, and applying his business world experiences, Garrett has created multiple solutions that not only empower and encourage teachers, but also help educators instill hope, grit, and exemplary character traits in each of our nation’s students. The Kids are Smart Enough -- So What’s the Problem? will be available in eBook, hardback, and paperback through Amazon, Barnes & Noble, and the publisher, Rowman & Littlefield, a leading independent publisher out of Lanham, Maryland, known for Academic Publishing, Educational Publishing, and the Publishing of Government and Official Data. Paperback copies will be available for $30 and eBook versions will be $28.50. Update: On Sale Now! eReader, Hardcover, and Paperback version are all now available for purchase on Amazon, Barnes & Noble, and Rowman & Littlefield.